Does anyone in The Commentariat wish to have some unusual seeds? No, sorry, it’s not weed, coca, or opium poppies. It’s maple trees. I simply could not stop my hands from clicking “BUY” when I saw these and I have no idea if they’ll survive up here or not. But I’ll have more than I need and perhaps one of you would like a few. If so, how to contact me is on the sidebar. As I mentioned [stderr] I am willing to help bankroll development of roundup-ready naughty things – if anyone has the necessary skills to produce such things, leave a secret message buried in a coffee can in your back yard and one of our underground agents will contact you. What I’d really enjoy seeing is glow in the dark or UV-sensitive koi. Someone please make that happen – please – do a kickstarter and watch the money roll in. Except for the small matter of having the perfect trifecta of evil after you: Monsanto, the DEA, and the cartels – a kickstarter for roundup-ready coca seeds would be an excellent denial of clue attack against the WOD. [cybi] Uh, now I guess I need to add the pro forma “don’t try this at home” disclaimer. Hmmm, I don’t like blue. Back in SoCal, we grew Bonsai. My faves were 20 year old elm, my 20 something pomegranate, and my most fave, a crepe myrtle with a canopy spread at the limit of accepted bonsai size. It was around 37, still fairly young, and every person who saw it used to declare “no, that’s fake!” as the first response. The plant is this photo certainly looks gorgeous and I’d love to have something like this on my windowsill, but… Where do I even get started? I see so many problems here. 1. How can you offer seeds without giving the name of the plant that’s supposed to grow from them? Judging from the photo I’d say this is probably some cultivar of Acer palmatum, but that’s not the full name. There are countless varieties of this plant, so knowing it’s full name would be useful. 2. Before buying seeds it makes sense to look up the plant info online and figure out what growing conditions this plant needs. Nowadays Internet will provide you with info about needed growing conditions about pretty much any plant in existence. This avoids disappointments that result when I have no idea if they’ll survive up here or not results with the plant dying. 3. I’m pretty certain that this is fake and you have been tricked. Firstly, the photo seems photoshopped for me. Examine closely the edges of those leaves in the corners (especially the left side). There are some weird colors. Secondly, I tried googling for “blue maple bonsai for sale” and there was a curious trend in the results. All the seedlings or grown up plants offered for sale were with red or green leaves. All the offers for blue leaves were seeds (rather than plants). How comes? I’d say the plant doesn’t exist. Thirdly, even if the blue leaved plant was real, you couldn’t propagate it via seeds. Do you know what a “cultivar” is (I’m not sure how much I need to explain to you about this)? Basically, “cultivars” are asexually propagated clones. Whenever you buy an apple tree, it wasn’t propagated via seeds, it was propagated via asexual methods to ensure that your apple tree is an identical clone to its mother tree. When a plant gets propagated via seeds, the seedlings normally end up being different than parent plants. A blue leaved plant would be quite likely to produce green leaved offspring when propagated via seeds. There are many gorgeous house plants that should be bought as plants rather than as seeds, because they are such a pain to propagate, that it’s easier to just buy a plant and leave seed germination for professionals. 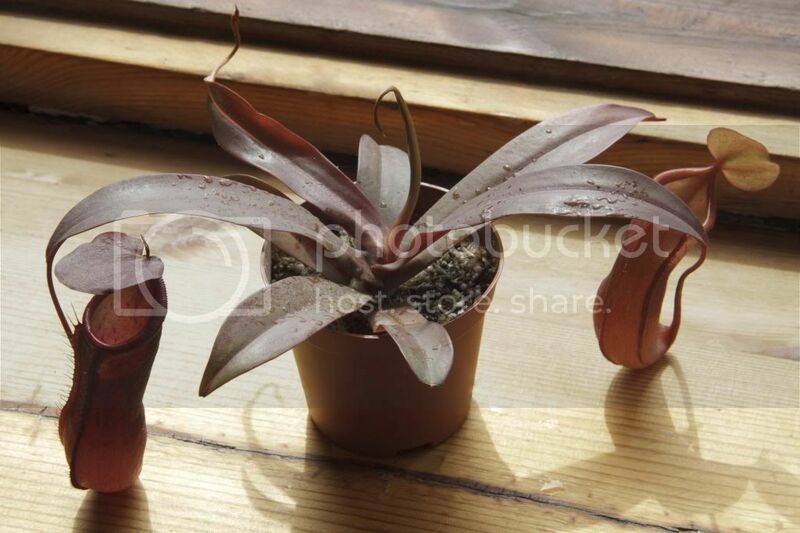 By the way, while searching for blue leaved plants I found this one: https://www.visionlearning.com/blog/2014/10/10/blue-plants/ Apparently they aren’t that simple to make. Anyway, there are a lot of dishonest sellers in places like eBay selling fake seeds. It makes sense to check their claims before paying your money. And there are fake seeds for pretty much any desirable and nonexistent plant one can think of. What I’d really enjoy seeing is glow in the dark or UV-sensitive koi. Someone please make that happen – please – do a kickstarter and watch the money roll in. Except for the small matter of having the perfect trifecta of evil after you: Monsanto, the DEA, and the cartels – a kickstarter for roundup-ready coca seeds would be an excellent denial of clue attack against the WOD. My personal desires are different. I want grape, apricot, peach etc cultivars that are cold resistant and could be grown in northern parts of Europe. And I also want Nepenthes cultivars that can put up with the low air humidity I have in my bedroom (I’m already growing lots of Nepenthes plants on my bedroom windowsill and they are mostly growing quite well, but it is clearly visible that they would be growing a lot better in higher humidity). Oh, and I also want easy-to-grow-as-houseplants orchids with blue flowers. And Nepenthes with blue pitchers. Blue is my favorite color, so anything blue is cool. I always thought bonsai would be fun and I do have a greenhouse of sorts. I am growing tomatoes there. They are work as you must constantly go in and shake the plants, as the wind would do if they were outdoors. @Ieva Skrebele I also love the color blue, and I do grow orchids as well. No blues, alas. The only “blue” orchids I’ve seen are ones that have been dyed. Once the flowers die and they spike and bloom again, the flowers are merely white. I too would spring for a blue orchid! 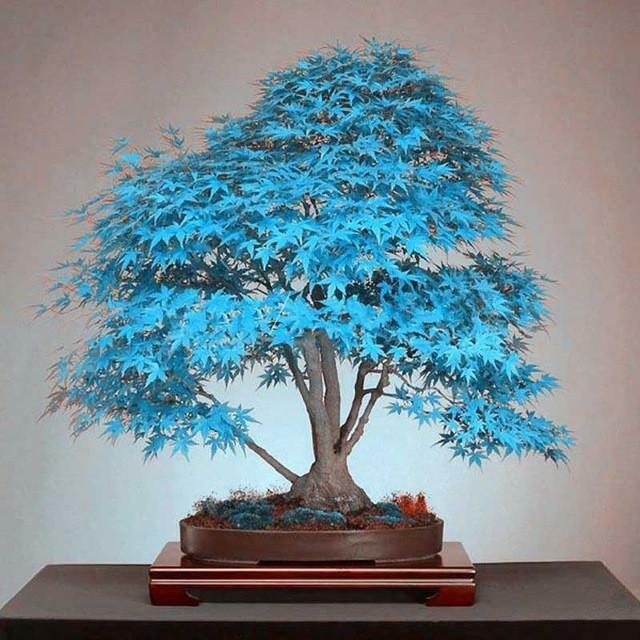 This is Acer palmatum, and the colors are probably fake. Judging by the blue coloured moss and reddish shadows my guess would be someone was playing with photoshop. If it were real, then the moss would not have the same color as the tree leaves, it would be green no matter what. Google finds some sellers of these seeds even here in CZ, and there are other similarly faked pictures mixed with real ones. It is not true that cultivars cannot be propagated from seeds. Some can, but care must be taken and artificially pollinate the blossoms with the right pollen and I doubt this is done for japanese maples, I certainly never heard of it and I have never seen Acer palmatum cultivar that was not grafted. And I am very skeptical of any blue-coloured leaves in general. Blue is the color that chlorophyl absorbs with greatest efficiency, so it would be a total waste for the plant to reflect that color. It is already waste for the plant to have red leaves, because red is second best light for photosynthesis. BTW, I would love to get my hands on ordinary sugar maple seeds, but I will not ask for you to send me any, because that would probably be illegal. I already smuggled some Cupressus californica seeds in 2000 (the bonsai trees are doing great, but are not done yet). Sorry for multiple posts, but I tried to adjust the colour sliders to get to real colors and this is what I think the original picture looked like before it was photoshoped and posted with false colors all over the internet on sites selling these dubious seeds. I hope you will not take this personally, but I will not believe these trees exist untill I see one. I think you may be wrong about “cultivar”. It simply means cultivated variety, and does not imply anything about the method of reproduction. Some cultivars breed true on their own; some are hybrids of carefully maintained parent populations; and some are clones. Only the latter are not grown from seeds. I also love the color blue, and I do grow orchids as well. No blues, alas. The only “blue” orchids I’ve seen are ones that have been dyed. Once the flowers die and they spike and bloom again, the flowers are merely white. I too would spring for a blue orchid! Well, there’s “Doritaenopsis ‘Purple Martin’” (and a bunch of other similar bluish doritaenopsis cultivars). It’s not exactly blue (the color leans towards purple), but it is sort of bluish. And this one is easy to grow as a house plant. There are also a lot of really blue orchids in the Vanda genus, but you cannot grow those as houseplants. Unless you live in a tropical place that is (another alternative is to grow them in a terrarium with controlled temperature, artificial light and humidifiers). The “blue” orchids sold in shops are white Phalaenopsis infused with blue dyes. I think those look artificial and ugly. The colors are too intense to look natural and the blue hue isn’t even (some parts of a flower are brighter and other parts less bright). I think you may be wrong about “cultivar”. It simply means cultivated variety, and does not imply anything about the method of reproduction. For many plants it is impossible to ensure that your cultivar remains stable when it is propagated via seeds. For example, most fruit trees are not self-pollinating. In order to get an apple, the flower must be pollinated by honeybees and the pollen must be from another genetically different apple tree. When two genetically different organisms make a baby (in this case the “baby” is an apple seed), the baby isn’t going to be its mother’s clone, it’s going to be different. Thus the plant grown from a seed won’t be the same cultivar as its mother plant. This is why in order to ensure uniformity and stability cultivars are propagated via asexual methods. For example, “Royal Gala” is an apple cultivar that gets propagated via grafting. 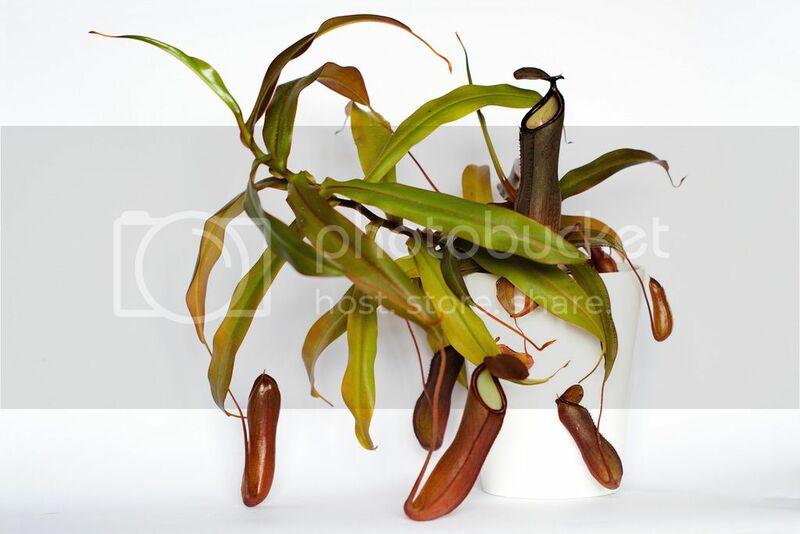 “Nepenthes ‘Rebecca Soper’” is a Nepenthes cultivar that can be propagated either via tissue culture or via rooted stem cuttings. Dionae Muscipula cultivars like “Akai Ryu” or “B52” can be propagated via leaf pullings or dividing multiple growth points or tissue culture. The very point of a cultivar is that all plants are genetically identical. And the very reason why plants evolved flowers and seeds was so that the offspring would be genetically different from its mother plant (via cross pollination). By the way, before somebody starts correcting me, I know that self-fertile fruit tree cultivars do exist. But it took plant breeders a lot of effort to make them. For example, self-fertile sweet cherry trees didn’t exist until Latvian Canadian plant breeder Dr. Charles Lapins (Latvian spelling of his name was Kārlis Lapiņš) selected cultivars like “Stella” and “Lapins” in 1970ties. And he got self fertile sweet cherry plants by exposing cherry seeds to radiation before sowing them. I find it curious that some GMO haters are afraid of GMOs, but they are perfectly fine with eating cherries grown from irradiated cherry seeds. Completely illegal to buy, sell, or own in Europe and Canada, of course. Several years ago, when I was teaching an undergraduate course, one of the assignments I gave my students was to use a biochemical pathway map to figure out how to genetically engineer a blue rose. Breeding a blue rose was a famous challenge among botanists for a long time. They could get various shades of purple roses, but never a true blue. An enterprising biotech company took it upon themselves to figure out why simple breeding could never make a blue rose. Several other plants are perfectly capable of making blue dyes in their petals, so why not roses? It turns out that all rose plants (including white roses) express a gene that shunts the chemical precursor to the blue dye down a different biochemical assembly line that would ultimately make a red color. So even if you added a gene that makes a blue dye, you won’t get a blue color. You have to first remove the gene that makes the red dye precursor. I thought it was a clever assignment, but it got mixed reception from my students, who found the software’s interface confusing. It’s probably my fault for not explaining it better. Still, I think it gives a pretty good idea why some traits are more easily bred than others. You have crushed all my hopes and dreams into a little puddle of woe. Nah, that’s OK. I kind of expected it. I did not expect someone to find the original un-photoshopped picture, though. That was a neat piece of work on your part. Did you use tineye or something like that? (Most of those discard color information and do edge vector analysis) I should have thought of that. Sigh. My mistake for getting my hopes up. Damn you, lying marketers! That’s a really good explanation – that completely makes sense – leaves evolved to be green for a reason. I think what threw me is that I also know leaves turn red when they’re dead and are being discarded by the tree for winter. I believe that the red color is just a byproduct of decay or something like that – it’s what Gould called a “spandrel”: an evolved side effect that has an effect but makes no difference. I have to admit I didn’t really think about this much. I just saw it and went “ooooooooclickyclicky!” which may have something to do with why I have too much crap, come to think of it. My personal desires are different. I want grape, apricot, peach etc cultivars that are cold resistant and could be grown in northern parts of Europe. You’d have farmers all over Europe trying to hunt you down, especially the French wine-growers. They aren’t marketers, they are cheaters. A marketer makes the existing product appear as desirable as possible. A cheater sells one product but ships something totally different. Plant seeds are a beloved product for scammers willing to cheat buyers out of their hard earned money. Buyer will realize that she’s been cheated only several months after making a purchase (when the seedlings sprout) and by then it will be too late to leave negative feedback and open a dispute. After looking around online I found no respectable plant nursery selling either blue maple seeds or blue maple plants. I found no eBay sellers offering for sale blue maple plants. There were only some anonymous sellers offering seeds. I wonder why? By the way, new and rare plants are normally introduced by respectable plant nurseries. It takes a lot of money and effort to breed an unusual plant with rare and desirable looks. Often at first these new plants are quite expensive. And sometimes it takes years until they are ready for mass production (that depends on the plant species and possible methods of propagation). Most plant leaves are green, because that’s how plants do photosynthesis most efficiently. But there are plenty of exceptions. Many plants normally have red, purple or yellow non-dying healthy leaves. You must have seen such plants among cultivated house/garden plants. And there are also lots of cultivated plants with variegated leaves (green with white or yellow or red or purple). Variegated leaves arise because of a lack of chlorophyll in some of the plant cells. It is usually the result of a cell mutation. In nature these forms often die out, being weaker growers because of the lack of chlorophyll. In horticulture these forms are propagated, because they look cool. The interesting thing is that a few variegated leaved plants do exist in nature. There are many speculations why; one of the hypothesis is that variegated leaves help plants to ward off hungry herbivores. As for red leaved plants, often they have red leaves only when grown in direct sunlight. If grown in a less bright location, these plants start growing green leaves. This http://i1289.photobucket.com/albums/b505/AvestraS/Rebecca_Soper_zpsf996b0a5.jpg was my Nepenthes plant in the middle of summer after getting lots of light. The leaves were a shade of dark red. And this http://i1289.photobucket.com/albums/b505/AvestraS/RS1_zpss5hudfwp.jpg is the exactly same plant photographed a year later after a dark winter. As you can see the leaves grown during winter became green, because there was significantly less light.